Through Sola Gracia, the leadership of George and Erica Mueller extends throughout Germany and Eastern Europe (Romania, Poland, Baltic Russia, Hungary and Lithuania), and into Cameroun, Africa through Upper Room Fellowship. In Cameroun we researched an unwritten language for a tribe and immediately began translation of the Scriptures. The regular daily Bible classes became the basis for a local church. They are well established and now conduct seminary-on-tape once a week. In Germany, we encourage local church leaders in 'rightly dividing the Word of Truth' through translation of books by R. B. Thieme, Jr. in German with topical studies on our website. Students are located in different parts of Germany. We have regular conferences in our home. Our G.I.s enjoyed our home for conferences for the past 20 years. For Romania we just finished more than ten translations being mailed out and also published on our website. For Hungary 'A Matter of Life & Death' and 'The Faith-Rest Life' are being distributed all over the Balkan. The translation of 'Prayer' by R. B. Thieme, Jr. is currently prepared for printing. Poland and Lithuania receive communication of encouragement. We left Prep School materials for teaching. In Baltic Russia a retired Colonel opened his home for classes and receives dispensational books for the reading room. 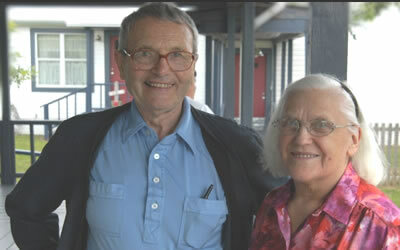 George and Erica Mueller seek always to teach 'Faith alone in Christ alone' for salvation, Eternal Security, Rebound, and dispensational teaching in the vernacular. This is our protection against all heresies. Face-to-face teaching, translation and distribution of written materials, distribution of audio messages, Internet-based communications, and the support of faithful friends. These ministries seek to firmly establish those whom they have reached with Bible doctrine in their own place of service by means of biblical principles.